Gaia Touch exercises are a series of simple but effective exercises that help us connect deeper with nature and our own “elemental selves”. In truth, the times we now live in require new measures to respond to the changing conditions upon our planet. Gaia Touch addresses the need for new measures. I incorporate Gaia Touch exercises into Celtic festive walks, tree workshops and even my tours of the Burren. They are an arguably significant offering to address these changes we are facing. I had a beautiful day thanks. I use my intuition to adapt the exercises. My friend the artist and earth healer Marko Pogačnik of Slovenia, invented them over many years. By good fortune and in answer to his search, he received messages from the elementals. They inspired him to create them to share with interested humans. I have worked with Marko in Derry and in the Burren, at profound levels. For an interview I conducted with this gentle, soulful being, read here. 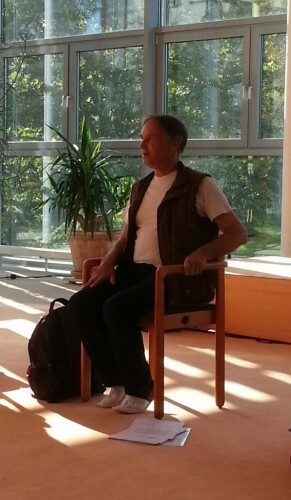 “I started to perceive and formulate the Gaia Touch exercises one by one after the year 1998. Then the Earth transformation process started to reveal itself. By Earth transformation I do not mean the shadow side only identified as climate changes. According to my perception it is a process through which new conditions of life are emerging upon the planet. In addition it has a new, more subtle space and time structure. I believe that the Mother of Life decided to set these changes into motion to prevent the destruction of vital capacities of the Earth. In short, to continue enjoying the beauty and creative challenges of this planet we have to adapt to changes – not just spiritually but also bodily. Contact Earthwise so we can plan the logistics of offering you a short programme. Contact me if interested in joining in the future.